We have recently received many inquiries from Lion leaders with genuine concern for the victims of Cyclone Idai in Mozambique, Malawi, and Zimbabwe. Malawi, Mozambique, and Zimbabwe are in a state of national emergency and are leading a humanitarian response in their respective countries, supported by humanitarian partners. Thousands of people are missing, hundreds reported dead, and search and rescue efforts are ongoing. The government and authorities report the need for emergency relief items including tents, food, medicines, and helicopters for rescue operations and delivery of assistance. Due to the extensive damage to roads from extremely heavy rains, it has been difficult to assist affected people. 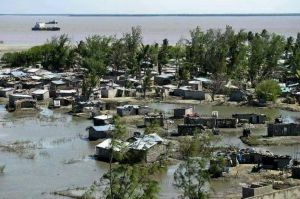 To assist local Lions in their relief efforts, LCIF has awarded three grants; two emergency grants of £7,500 and a Major Catastrophe Grant of £38,000 to provide resources such as maize flour, clothing, tents, blankets, and other needed relief items in Mozambique, Malawi, and Zimbabwe; with more grants that may follow. Thank you to those who have already taken immediate action to aid the victims affected by Cyclone Idai. Please encourage donations to the LCIF Disaster Relief Fund. Our Foundation is a beacon of hope for those that have lost everything. 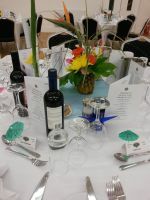 The 54th Annual Convention in Weymouth 22nd-24th March 2019 was a great success - the full report and photos can be viewed here. The 53rd Annual Convention for Lions District 105D took place on Saturday 24th March 2018 at the Royal Beach Hotel, Southsea, Portsmouth. See the report. The DG Partner Charity this year is Different Strokes. Read Debbie's story. The Countess of Wessex G.C.V.O. as Patron of Lions Clubs of the British Isles held a Royal Reception at Buckingham Palace on Wednesday, 28th February to celebrate a ‘Century of Service’. HRH has been our Patron since 2004. 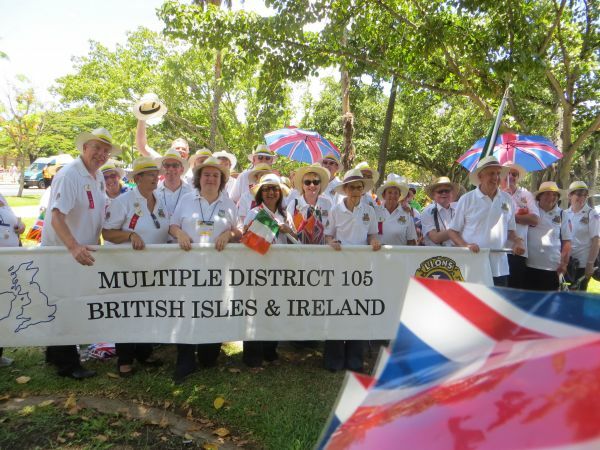 Hundreds of Lions members joined together for the 100th Birthday of Lions Clubs International to celebrate this landmark anniversary with the organisations’ partners. Lion Phil Nathan MBE, Chair of the Centenary Celebrations for Lions Clubs of the British Isles said “let me begin by saying that during our 1st Century of service, Lions Clubs have touched millions of lives of people that needed us. 100 years of service to the community is a remarkable achievement, made possible by the selfless actions of many thousands of individual men and women, each of whom has sought to make ‘their’ community a better place. As we enter our 2nd Century, the cry for help from those in need will most certainly become louder and we as volunteers are ready to show as Lions, We Care”. Lions Clubs International focusses through its Lions and Leos members upon major projects that address diabetes, youth, the environment, hunger relief, childhood cancer and sight issues affecting communities throughout the world. In 2010 I listened to Lawrie McMenemy address our national convention in Leeds. He reduced many of us to tears of emotion as he described his work with the Special Olympics organisation and his speech motivated me to volunteer at the next national games in Bath in 2013. 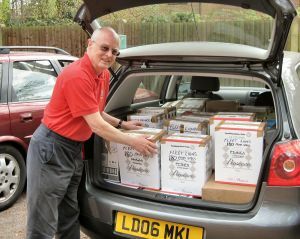 It proved to be the most fulfilling, and rewarding, week of my time as a member of Lions Clubs! Together with the dozens of other Lions from around the country, including many from our own District, I experienced the same emotions Lawrie had described 3 years earlier. This was the true meaning of what we do in Lions - “We Serve”. In 2016, my experiences led my son, who lives in Los Angeles, to volunteer at the Worldwide Games in California - with the same result. In 2017 - our Centennial year - Lions will again be supporting the next National Special Olympics GB (SOGB) Games in Sheffield with 3,000 athletes and 5,000 family members (many from our area) by providing the Families Programme. I will be there working directly for SOGB as an event coordinator at the football tournament. Before that happens, I am proud to say that Lawrie McMenemy has accepted my invitation to speak at our District Convention in Bournemouth; local Special Olympics athletes will also be there as meters and greeters. Recently new electronic advertising for Lions has appeared throughout in the centre of Aldershot on brightly lit Monolith displays. 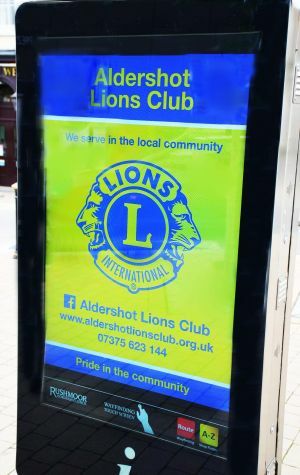 The electronic signage is incorporated in a rolling display of local advertisements and promotes Aldershot Lions Club. 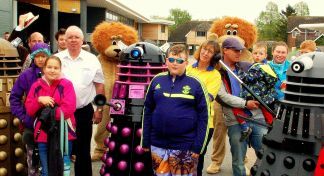 "As part of my work representing Aldershot Lions at the Aldershot Action Together (ACT) Residents Association & the Aldershot Victoria Day Committee I approached Aldershot Town Centre Manager David Phillips about advertising on the town's Monolith boards. In turn, he passed me onto Gill Chisnall, Corporate Communication Manager at Rushmoor Borough Council. That resulted in Gill making a bid for funding from the Council's charitable budget for the use on the Monolith boards which was passed by Rushmoor Borough Council. After refining the design the artwork was submitted to Monolith and rolled out". "Although it took nearly 5 months of negotiations, agreements with the council and technical submissions this has been very successful. The advert is now running 24/7 on 7 Monolith boards around Aldershot Town centre which is hoped to run for at least 6 weeks advising residents and visitors to the town of our Lions Club and also to advertise our membership number for further assistance. We are sure in time this will assist us with the recruitment of new Lions members"
"We would like to express our thanks to Richard and Andrew Keeley for the artwork, David Phillips, Gill Chisnall & Nick Holland, Rushmoor Borough Council and all the residents of Aldershot who keep asking us questions about Lions". 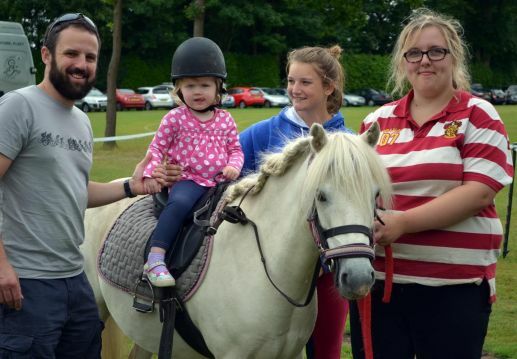 33 Lions Clubs provided approximately 1,580 children, adults and carers of people with special needs to a fun day out at Paulton’s Park near Southampton on Sunday 7th May. Some travelled by coach whilst others chose to use their own transport to suit their personal needs. The organising team from Warminster Lions Club were on hand to handle ticket enquiries, ably assisted by members from Romsey and Meon Valley. Also on hand were Lions costumed mascots and a pair of “Bournemouth Bunnies” to greet the guests on arrival. Once in the Park guests came face to face with Star Wars, Dr. Who and other Sci-Fi characters brilliantly portrayed by members young and old of the Costuming Group Milton Keynes Garrison, who gave their services free of charge in support of the Lions Day, and a huge vote of thanks must be given to them. 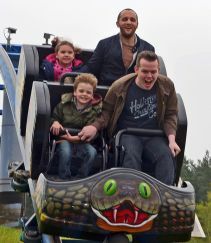 A new attraction at the Park this year is the dinosaur theme park world “Lost Kingdom”, a huge modern day update in addition to the wide range of attractions on offer. 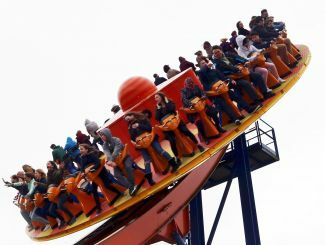 The teenagers enjoyed the roller coaster rides, and because of the warm weather the wave runner, log flumes and water play areas were very popular with both young and old! Peppa Pig World was a big hit with the younger children, especially the boat trip and splashing in muddy puddles. The grounds and gardens are beautifully kept, as always, and this year enhanced by topiary features of Victorian ages including a penny farthing bicycle, coach and horses, various animals and entertainers. Of much interest and amusement was the scene remarkably created of a lion tamer, complete with chair in hand, facing up to a menacing lion! The packed lunches provided were generous and delicious, and there was plenty of seating and shade for families to have picnics. 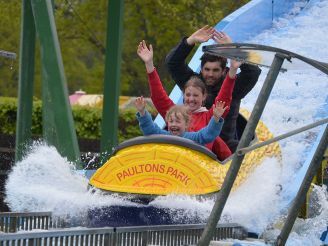 We are extremely grateful to the management of Paulton’s Park for generously allowing Lions Clubs from all over the District to enjoy the facilities offered for the day. It is so satisfying to see family units enjoying themselves in spite of what circumstances they have to cope with, and makes us proud to be Lions ! 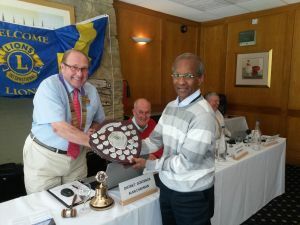 DG Alan Chapman presenting the Colin Rickman Youth Award to Eastleigh Lions Club via Lion Devan Kandiah at the District Cabinet meeting on Sunday 22nd May 2016. As our DG Elect Alan Chapman couldn't go to International Convention in Hawaii this year, we brought Hawaii to him at the Stones Hotel near Salisbury on Saturday the 18th of July, when PID Howard Lee installed Lion Alan Chapman as District Governor of 105D! Garlands were presented to DG Alan and Anne by Lions Kris and John Smith from Salisbury Lions Club. The evening was arranged by Sergeant-at-Arms Lion Dave Ebsworth who did a splendid job as Master of Ceremonies. Grace was read by 2nd Vice Lion Peter Burnett and the Loyal Toast was given by Lion Bryan Smith, president of Salisbury Lions Club. 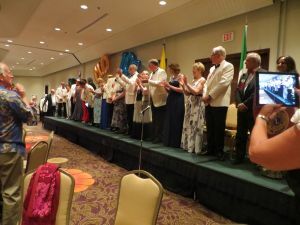 The toast to Lions International was given by the outgoing DG Lion Mike Hendy who expertly steered the District through 2014-15. 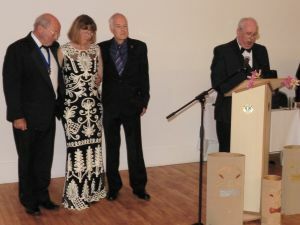 Mike sprung a surprise on his wife, PDG Lion Brigid Hendy by presenting her with a very well deserved Melvin Jones Fellowship Award on behalf of Bracknell and Burnham Clubs and 'himself' for all that she has done for the community and the Lions movement. The Lions Clubs International Purposes were read by 1st Vice Lion David Taylor prior to the installation of DG Alan. The raffle prizes ranged from a rocking horse to a case of wine and was enjoyed by all and then followed by dancing to Mustang Sally Disco run by Lion Rob Clarke. 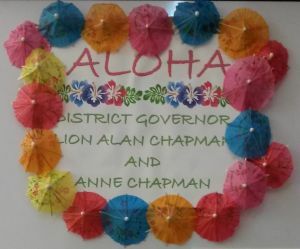 Best wishes to DG Alan and Anne for a great year leading our District. 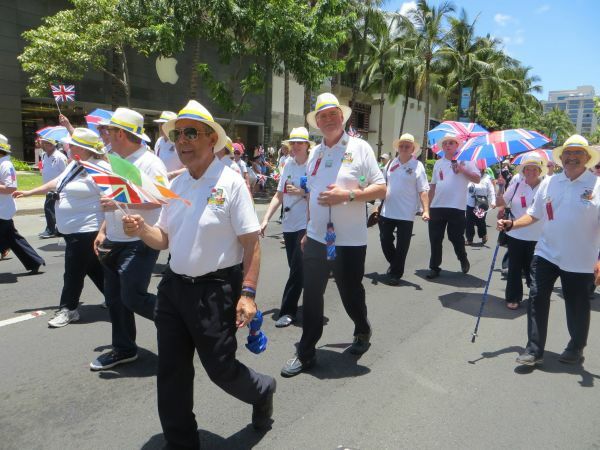 Over 23,000 Lions and guests from around the world, travelled to Hawaii for the 98th International Convention, held at the Hawaii Convention Center from 26th to 30th June 2015. We had 110 members and partners attend from MD105, but just nine from 105D. We held our normal B & I Briefing meeting at 7pm on Thursday 25th June at the Marriot Waikiki Beach Hotel. Following this Briefing meeting JTA Travel hosted a welcome drinks party on the balcony at the Marriott for all those who booked through them. This was well received by all who attended. 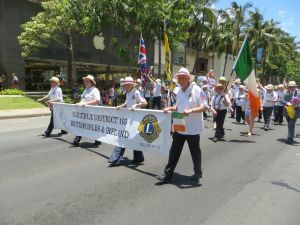 On Saturday morning of 27th June, the International Parade took place, with over 10,000 members in national dress and costume, together with bands and floats. 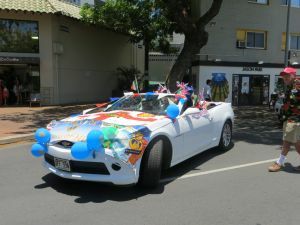 We from MD105 had the Celtic Drums and Pipes of Hawaii and also had an open corvette, which was decorated with flags, bunting and balloons, before the main bulk of our members. The Band won 2nd prize in the competition, which was a surprise and a great pleasure. 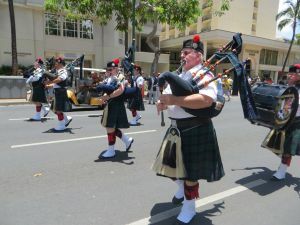 On the Saturday evening, at the Hawaii Convention Center, the International Show was held, with varied acts and dancers, culminating in a set from Country & Western star Kenny Loggins. Sunday 28th June at 9:30am saw the First (Opening) Plenary session of the Convention, where a wonderful flag ceremony, parading all 211 flags of the nations in LCI was held. An inspiring speech was given by Tim Shriver (nephew of Teddy Kennedy) who is CEO of Special Olympics, based in the US. He was truly brilliant and gave a marvellous insight into this worldwide organisation. 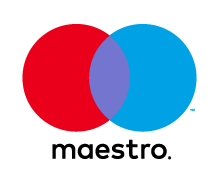 The current world games are being held in Los Angeles. Monday 29th, in the second plenary session, saw all the International Director candidates and 2nd VP candidates give there presentations. On Monday evening at 9pm, the B & I Reception was held at the Sheraton Waikiki Hotel, in the ballroom, and over 600 guests attended, from around the world. This is the event, in which the outgoing Council Chairman, (Michael Phillips) hands over to incoming Council Chairman (Simon Moss), who then introduces all the new DG’s. PID Howard Lee then made a brief introduction, and introduced PID Phil, who then between them, introduced any VIP guests who attended, who were many any varied, including PP Sid Scruggs III, PP Jim Irvine, PP Jimmy Ross, IPP Barry Palmer and many other guests. We provide desserts only for this event, as it is the last and latest Reception, with a cash bar. We were delighted also to welcome Tina Yap and Terry Quinn from the Celtic Pipes, to play for us early on and then pipe in the new DG’s. Tuesday 30th at 9:30am saw the closing Plenary session of Convention, where we listened, again to a very strong speech from Carolyn Miles, President and CEO of Save the Children. Carolyn was also presented with the Lions 2015 Humanitarian award, the highest honour of the Association, for $250,000 from LCIF for continuing humanitarian services. Previous recipients have included David Foster, President Jimmy Carter, Mother Teresa and Condoleezza Rice. The new International President Dr. Jitsuhiro Yamada of Minokamo, Gifu, Japan was sworn-in as 2015 – 2016 International President, by Immediate Past President Joe Preston. President Yamada is a neurosurgeon and gave a very emotional inaugural speech. Also elected as 2nd International Vice President was Naresh Aggarwal of Dehli, India. We all left, tired and happy, and now ready for Fukuoka, Japan in 2016! 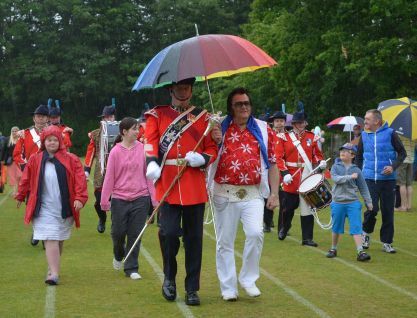 The long-standing annual traditional fun day for people with disabilities returned to Yateley at the end of June. 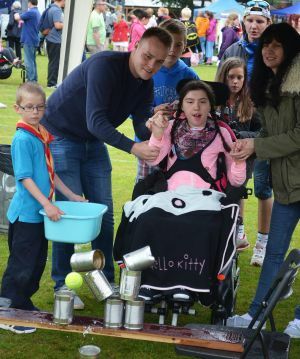 Lions Clubs from Aldershot, Farnborough, Fleet, Hart, Hook & Odiham, Maidenhead, Loddon Valley, Sirius and Yateley & District held their annual festival of fun for disabled people of all ages from throughout the south of England. Also included were displays from The Cinque Port Corps of Drums, fairground rides, cuddly farm animals and a barbecue. In my 41 years of service, I have heard many riveting stories. However, my visit to Nepal this month has to be the most powerful story I have ever seen. The villain of this story is someone we cannot even understand. The motives of Nature will forever be beyond our comprehension. It has filled the gates of heaven with young angels. I have visited Nepal many times over the years. The Nepalese people are almost always modest of themselves, respectful of others and fearing of God. Their elevated land is one of exceptional beauty. This same land that has made their country famous has now made them pay an insufferable price. Over 7,000 people have left us. Over 100,000 have been stolen of a home. Over 10,000 recover from injury. In Kathmandu, funeral pyres burn through the day and night. The eyes of the survivors are hazed with shock. They spent their entire life building a home. They worked their entire life to support a family. Many of them have now lost both. Their life’s work has been taken away by a moment of Nature’s anger. Now, their first struggle is simply to survive. Clean water and food are in short supply. The street is the only bed and the stars are the only blanket. Nature has failed them. Can human nature save them? The heroes of this story are among us. Since the need arose, Lions have risen. The Lions of Nepal, captained by PCC Sanjay Khetan, MCC Bharat Dhugal & many more leaders have led the charge. I have seen their work in Kathmandu, the villages of Kantipur & Bhaktpur etc. Lions are working day and night. Every day, we are saving lives in Nepal. We are also giving hope for a new life. Lions are distributing food, water, clothes, sanitary ware etc. The queues for each item are very long and full of tension. I could see the fear in people’s eyes. They realize that surviving the aftermath of an earthquake is as difficult as surviving the event itself. Life in Nepal still hangs in a very delicate balance. 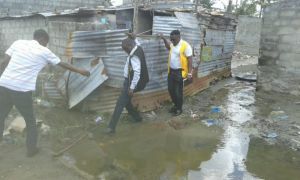 LCIF sent immediately $ 100000 for Emergency relief. Donations have come from Lions across the world. Some have pledged money, others have shipped basic necessities. Lions in the British Isles and Ireland sent a plane full of water purifiers. The team of Lions on the ground is doing their best to stretch every dollar for maximum effect. Every donation will make a difference. There is a fine line between peace and chaos. We are at this very focal point right now. The Lions of Nepal have shown the victims that order and discipline will be rewarded. Without these rewards, there is no imagining what may happen. Together, we must see the people of Nepal through this most testing time. Mahatma Gandhi once said, “In times of hunger, God can come only in the form of bread.” Every volunteer is a hero. So is every donor. As Lions, we pray and hope. Most importantly, we act. Every person who has acted has proven to be a hero. However, this story has no hope of a happy ending. There is no hope of justice. Or of victory. There is only the hope of hope. The survivors must see hope again. They must look forward to a new life. They must smile again. The economic damage of this earthquake has been estimated at US$10 billion, which is half the annual Gross Domestic Product of the country. The people of Nepal have always lived very humble lives. The GDP per capita below US$2 per day. 40% of the population is unemployed. This country needs heroes. It needs faith from the world. The message of this story is simple. As long as we are alive, there is a reason to live. A reason to be thankful. There is still hope for Nepal. 24 hours after the quake, almost all Nepali troops and police were deployed. They received some radars from the French Army that detect human breathing. Soon, a 4 month old baby was pulled from under his collapsed home. For this baby, there is still hope. We shall give him a reason to live. 120 hours later, civilians continued to dig through the remains of a flattened hotel. Nearby, a foreign medical centre still kept a set of ambulances with emergency first aid. It seemed like they were digging for a cemetery rather than for a rescue. However, all of a sudden, a stray dog barked. Something was breathing beneath the rubble. A few minutes later, a teenage employee of the hotel was pulled out alive. The ambulance gave him an intra-venous injection. After 5 days on the brink, his eyes finally opened. For him, there is still hope. The average victim has lost his home and a large part of his family. However, he still reaches out to contact relatives who may still be alive. He gathers his belongings in a bag and wonders how he could make money. He lies down on the street corner to get some rest in the night before battling the next day. There is still hope in his heart. Mt. Everest is only a few hundred kilometres north of Kathmandu. It’s 8.6 kilometres (5 miles) shook that day, causing avalanches that immediately killed 17 climbers. In 1924, the British Empire had sent their renowned explorer, George Mallory, to make the first serious attempt to conquer the world’s tallest peak. When asked why he would make such a massive effort to climb the mountain, Mr. Mallory replied, “Because it’s there”. Our task is very similar. Why should we make such a massive effort to help the survivors? Because they are there. Because they are still alive. And it’s also because we are here. On the same planet. The same things make us smile and laugh. We just need to share the happiness. Together, we will make Nepal smile again. 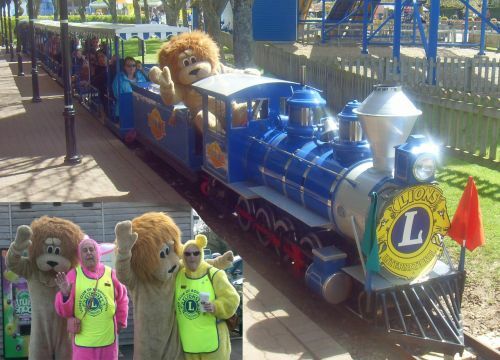 In April each year the Lions Clubs in District 105D provide a Paultons Park "Day out with the Lions" free of charge for those less fortunate, disabled and vulnerable members of their communities. Although the weather did not look promising early in the day it soon warmed up with the welcome the guests received from the Lions. There were free cuddles at the entrance from rather large Lions and even a welcome from a few Daleks! These science fiction creatures also got close to District Governor Mike Hendy but he managed to avoid being exterminated! 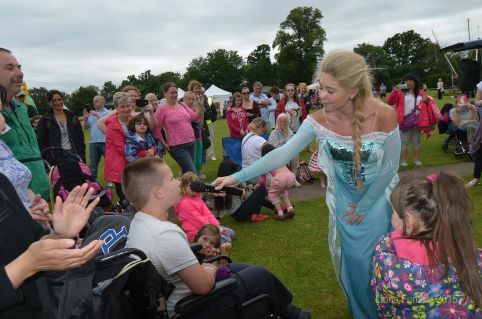 Over 1700 guests attended the day out and this was achieved a huge amount of fundraising by Lions Clubs in 105D. Included were young carers, disabled groups, children unable to live at home as well as lots of other organisations in need of a good day out. 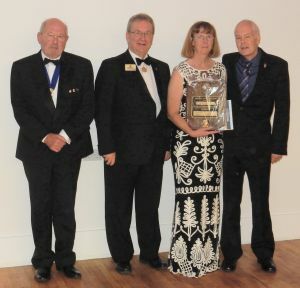 Congratulations to Petersfield Lions on an outstanding SpecTrek. A record total of 138,148 pairs of used spectacles have been collected this year for redistributing to needy people all over the world. 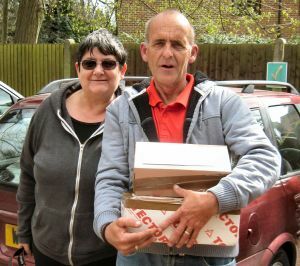 Photos show SpecTrek collection being delivered by Lion Grahame Pullen of Fleet Lions Club and Lions Ian and Carole Hambleton of Aldershot Lions Club. See our Sight Matters page for more information. 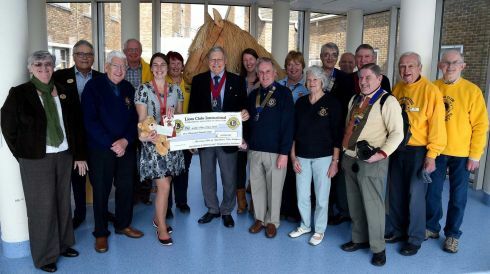 Members from the Lions Clubs of Blackmore Vale, Bridport, Dorchester and Weymouth & Portland which make up Zone 1A of Lions District 105D gathered at Dorset County Hospital to present a cheque for £2000 to Gully’s Place Trust as a Zone Project to help towards the purchase of beds. Gully’s Place Trust provides children’s palliative care across Dorset to provide care following diagnosis of life limiting illnesses. Zone 1A Chairman Lion Peter Oswick is shown presenting the cheque to Lead Nurse Allison Ryder. Click Here for an information leaflet about Gulley's Place Trust. Bournemouth Lions Club are busily preparing for their first pantomime 'Daisy Daisy' to be staged on Saturday 31st January at Pelhams Park Community Centre, Kinson, Bournemouth, BH10 7LH at 2:30pm and 7:00pm. The main aim of holding the Pantomime is to provide an affordable family event for the local community. Pelhams Park Community Centre was chosen as the venue because many young families live within that locality. 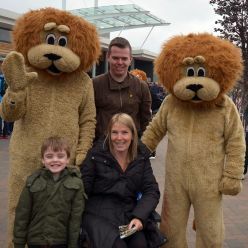 Bournemouth Lions are providing 50 tickets free of charge for young carers in the local area to recognise the work they do throughout the year to care for disabled relatives. The Lions are also contacting local companies and shops to ask for sponsorship or donations of raffle prizes. 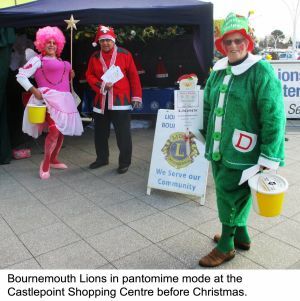 This helps to spread the word to local businesses that Bournemouth Lions Club is working hard to help others in the community. 'Daisy Daisy' is the first pantomime of its type, written and directed by Lion Barrie Haynes who has set the story in and around the Bournemouth area. It promises to be filled with all the traditional pantomime capers while having a unique local storyline. Tickets are only £4 each for adults and £1 for children so the 31st January is a date not to be missed at the Pelhams Park Community Centre. Further details and tickets can be obtained by phoning Bournemouth Lions on 0845 833 2823.